Above: Harry Smith, director of Sustainable Economic Development and Dudley Neighbors, Inc., explains how community land trusts function at a forum on the topic. And development can occur without displacing low income residents. That’s a message Baltimore needs to hear, according to advocates speaking at a recent forum on an alternative development model known as Community Land Trusts, held at the University of Maryland School of Social Work in Baltimore. Participants at the Thursday conference, organized by the Baltimore Housing Roundtable, talked about how the “trickle-down approach” to development in Baltimore has failed. But the main topic of the gathering was the nuts and bolts of the group’s proposed solution – an agenda for equitable development that includes land trusts, local hiring initiatives and other community-led strategies. “Community + Land + Trust: Tools for Development without Displacement” was initiated by United Workers and produced over three years by a coalition housing advocates and others including the Public Justice Center and the community development clinics at the University of Maryland and University of Baltimore law schools. Their 40-page report – and campaign to influence community leaders and state and city officials – is especially timely given the recent announcement by Gov. Larry Hogan and Mayor Stephanie Rawlings-Blake of a plan to demolish some 4,000 vacant properties in impoverished parts of Baltimore and direct hundreds of millions of state dollars toward redeveloping them. The Roundtable members see their proposed 20/20 Vision Plan for Fair Development as a way to ensure that this city-state initiative (Project CORE) doesn’t drive out – and exclude from the planning – longtime residents. Under the Roundtable’s proposal, land trusts would receive $20 million annually from public bonds. Another $20 million would go to deconstruct vacant houses and hire residents and support community projects such as urban agriculture. A goal of the conference was to educate participants on how community land trusts (CLTs) work. 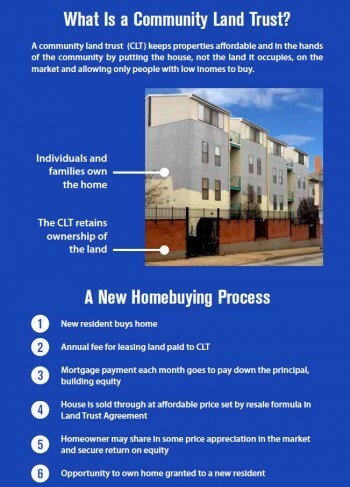 In simple terms, CLTs are arrangements in which a community organization holds land in trust which can be used for things like affordable housing, pocket parks and playgrounds or any other development purpose. Houses built on the land can be sold to low income workers who finance the purchase through a traditional mortgage. The homeowner owns the home, but the land underneath remains the possession of the community organization. From “Community + Land + Trust,” a report by The Baltimore Housing Roundtable. One of the country’s best-known CLTs, the Dudley Street Neighborhood Initiative in Boston, used the CLT model to turn around a community that was once approximately 50 percent vacant and largely used as an illegal dumping ground. Harry Smith, director of Sustainable Economic Development & Dudley Neighbors, Inc., explained the advantages of the Land Trust approach. CLTs not only reduce the cost of owning a home, since the homeowner does not pay for the value of the land, they insulate against foreclosures, Smith said. “That gives us the chance to step in and say, ‘You know what, Mr. Jones lost his job, we can work with him, do not foreclose on him,’” said Smith. He went on to note that during the height of the foreclosure crisis from 2008-2010, when five percent of home mortgages were foreclosed upon, less than one percent of CLT homes experienced the same. That ability for a community to step in and help their neighbors is an important aspect of CLTs, said Father Ty Hullinger, a pastor of three parishes in northeast Baltimore and a regular presence at social justice events in the city, who spoke at the event. 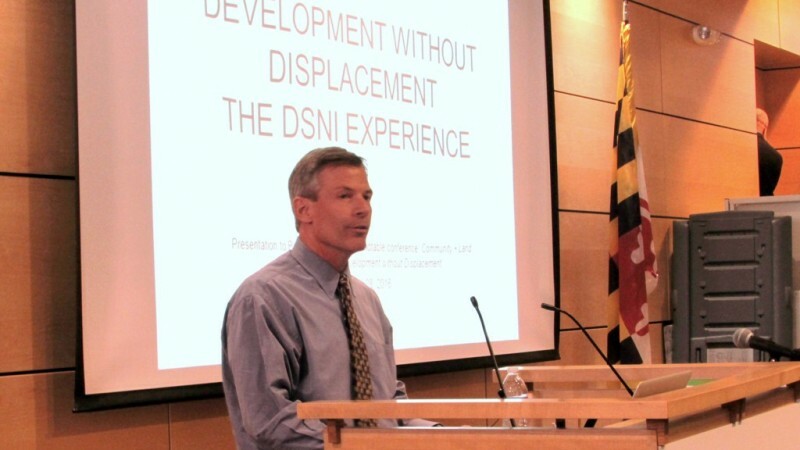 “The CLT helps communities see land as a common good, a resource that can be held in trust by a community itself, so that development on that land can serve the common needs of all people,” said Hullinger, who is also a board member of what he described as an emerging land trust in Baltimore, the North East Housing Initiative. “The CLT really does help us bring love and respect into the development process, because the CLT helps us find a way to bring real trust back into our neighborhoods, and frankly to our city,” he said. That reorientation of how communities view land is also important, said Peter Sabonis, director of legal strategies at the National Economic and Social Rights Initiative and a leader of the Roundtable’s project. As Sabonis sees it, CLTs represent a move away from structurally racist economic policies that enabled white flight and the loss of capital and manufacturing – phenomena that have benefited private interests and profit while decimating communities of color. “Even though we have admirably retooled our economy to a service economy, to a hospitality centered economy, we’ve been subservient, nevertheless, to trickle-down,” said Sabonis, arguing that CLTs place a community’s interests above that of private capital. The Roundtable’s lengthy report documents the trends and failed development policies they say have produced misery in Baltimore: biased and overzealous criminal justice policies, publicly subsidized “Gold Coast” development that has driven up rents 16% since March 2011, the disappearance of all but low-wage, non-unionized service sector jobs for most of Baltimore. But Alston offered a more personal take on what’s at stake in poor, majority African-American neighborhood such as Westport, where he lives. These communities, he said, need resident-driven approaches such as CLTs to buffer them from the speculative real estate practices that have produced white flight and concentrated poverty.